Walking on campus right now, it’s very hard to escape the sniffs and snuffs that plague so many students. With every classmate and passerby becoming a dangerous vehicle for the flu, being healthy should be a high priority. While exercise, nutrition, and proper sanitation are key factors to keeping your immune system strong, these plant-based suggestions for a cold and flu have been the go-to treatment and prevention of sickness for generations. Garlic is a relative of the onion and the leek, three pungent yet tasty vegetables with edible bulbs. All three have high amounts of funky-smelling compound allicin (named after garlic’s genus, Allium) that has many suspected health benefits as an antioxidant and blood pressure modulator. If you want the health benefits but can’t stand the smell afterwards, simply sip a glass of milk with your meal. Italian researchers have come to the conclusion that (non-skim) milk is a natural way to quickly eliminate garlic odor from breath—something washing and brushing your teeth will not accomplish, because the odor is caused by the body metabolizing garlic’s stinky compounds into a gas. The gas goes through the blood, up to the pores and mucous membranes like the mouth. To experience this metabolic phenomenon firsthand, ask for some garlic to be added to your stir fry on campus and onion slices to your salads. Plant it: with the cold weather and academic deadlines everywhere, it’s important to do small things for yourself to de-stress and be happy. Giving a root, bulb, or seed a chance to grow can be wonderfully therapeutic, and all that you need is a garlic clove or onion head, a cup, and a bit of soil. It’s best to have a small hole at the cup’s bottom for drainage, all a better reason to just use a plastic solo cup. Cover the clove or bulb with soil, ideally sandy soil, packing it down until the pointier end is just ½ inch underground. Water every day or every other day. A yellowing shoot means you need to water less or drain the soil (tip the cup upside down, covering the opening with your fingers so water can trickle through). Withering shoots mean that you need to water more often. The shoot will be lime green when it’s happy. Keep your plant on a sunny windowsill, and care for it well. Come spring, you may be gifted with a spherical flower. My landlord does not care about what I bury in the yard, so I planted half an onion head at the start of the semester. 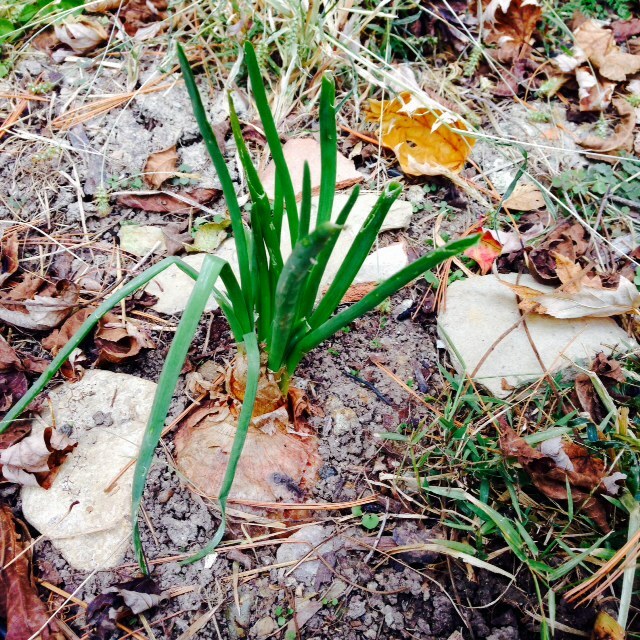 Despite the frosts, its shoot still peeks out of the ground. Ginger is a rhizome that many enjoy, and unlike garlic, its spiciness works just as well with sweets as it does with savory foods. Ginger is overall a very healthy food, and while on campus, you can get more of it in your diet by asking for ginger to be added to stir fries and picking baked goods with pumpkin spice in them. Candied ginger and ginger tea are also good ways to enjoy ginger, and can be fixes for a sore throat and cough. 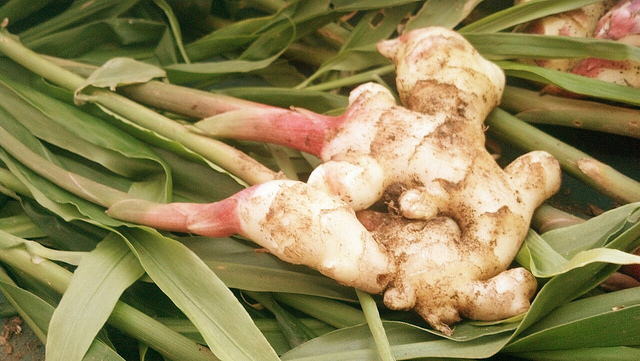 Plant it: as a tropical rhizome, ginger can be a bit finicky to grow into a proper plant if your end goal is to harvest the roots. But if you just want a dorm decoration until the end of the school year (or a horticulture experiment until winter break), plant a ginger root in a big bowl. Look for little nubs on the root that resemble potato eyes, and plant the ginger with those facing upwards. Wash the ginger beforehand to remove any pesticides or growth retardants that may be on the root, and water often but make sure the container is well draining, and keep it in a spot with bright, indirect light like a windowsill. Tea is another way to boost health any time of the year, and a hot cup of black tea with lemon can be a little thing to combat cold weather. Black, oolong, pu-erh, green, and white tea all come from the leaves of the same plant, Camellia sinensis. The leaves have undergone different methods of treatment, and have different flavor molecules remaining and/or created through fermentation. In order to avoid making green and white tea taste funky and bitter, it’s best to let a kettle sit for about 2 minutes after boiling. Black and oolong tea are both fine with being brewed in just-boiled water, as does pu-erh, but pu-erh is so strong that it is best brewed for under a minute. Many teas exist that are not actually teas, like chamomile tea and ginger tea. These herbal drinks have health benefits of their own. Tea is offered on campus at the many Starbucks locations, although lemons are awfully hard to come across and I very much recommend buying a lemon at a grocery to try in black tea. Plant it: I do not recommend planting the tea plant unless you do not mind finding one at a nursery. The tea plant is best kept indoors for winter, enjoys moderately acidic soil, and is drought tolerant. The biggest qualm some have with the tea plant is that it takes a long time for the leaves to be ready for harvest, and because you only harvest the very last three leaves off a branch at most, it can be quite an investment to have enough plants to have homegrown tea regularly. Herbs, however, can be grown easily to make herbal tea. Mint, sage, and many other herbs can easily be grown from seeds in a cup or bowl: just pay attention to the growing instructions. In a month’s time, you should have a young herbling growing. Winter can be brutal, so make sure to stay healthy and do things that feel rewarding. Growing and eating plants can help beat cold weather blues, so try tasting and growing them soon!